Ultimately, choosing the right monitor comes down pretty much to what you're going to be using your monitor most for. The ideal monitor for poring over stock-charts and online articles is not going to be the same as the one used mainly for photo-editing or gaming. Prices vary widely, from less than a $100 to more than $1,000, and it's important you keep in mind what you'll be using the monitor to look at most of the time. There's no single monitor that's perfect for everyone. Choosing the right one ultimately comes down to what you'll be using it for mainly. For general surfing, reading and looking at stock charts, a 60 Hz TN monitor from a reputable brand would be good enough. No need to go overboard with this one. If you're going to be watching a lot of movies on your monitor, you'd want an IPS monitor that has a high contrast ratio and a low black level. For photo-editors, you'd want an IPS monitor with a wide Color Gamut to make sure you're choosing the most appropriate color. For gamers, and especially First-Person-Shooter (FPS) gamers, fast response times with low delays are essential. TN panels used to be the competitive gamers panel of choice but IPS screens have improved over the years and for the casual, semi-pro, might actually be preferred. Wow, that was a lot of jargon there so let's go through some of the basics and then top it off with some more up-to-date concepts and miscellaneous ones. Size: The size of a computer screen is usually described by the length of its diagonal, which is the distance between opposite corners, usually in inches. Resolution: The resolution of a computer screen is the number of pixels, width x height (e.g. 1920 x 1080). The higher the resolution of the screen, the less pixelated the image will look, but it will tax your graphics card more. Also, larger monitors tend to have higher resolutions. Refresh rate: This is the number of times per second that a monitor can update it's buffer. Your monitor and graphics card work together to produce and image. Generally, the faster the refresh rate, the smoother the image. However, before going out and buying a 144 Hz monitor, make sure your graphics card is powerful enough, or you'll be wasting your money. Response rate: The response rate of a monitor is the time taken for a pixel to change from black to white. Response rate's very important for competitive gamers who usually go for monitors with response rates under 5 ms. For ordinary use, you wouldn't notice anything up to 10-12 ms. Contrast ratio: The contrast ratio of your monitor is the ratio of the brightest whites to the darkest blacks that the screen is capable of producing. This used to be in the ratio of around 1,000:1 but recently, manufacturers have been listing "dynamic contrast ratio" instead. You'll notice that Dynamic Contrast Ratio has numbers in the millions. You need to note that this number is based on your backlight turned off, which is not how you'd normally use your monitor. Either way, a higher number is desired. Just remember to compare apples to apples. Viewing angle: The viewing angle is the maximum angle at which the monitor screen can be viewed with acceptable visual performance. With larger monitors, you'd want larger viewing angles. This is because the angle between your eyes and the edges of the screen might exceed the viewing angle, causing the images to look distorted. Now that we've gone through the basics, let's put that knowledge to good use and look at some of the more interesting and up-to-date terminology, along with some miscellaneous ones you should keep in mind. If you look around for monitors now, we're sure you'd have seen the terms IPS and TN, but what do they mean? In-Plane Switching (IPS) monitors have much larger viewing angles and better color consistency and clarity than TN monitors. 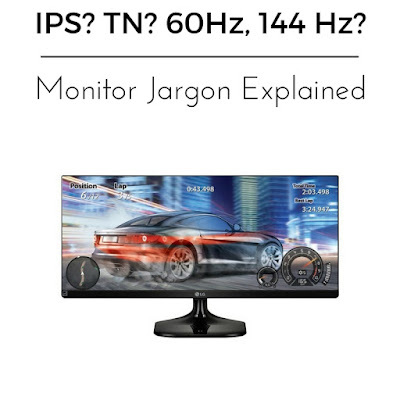 This however, comes at a price and IPS monitors are more costly to manufacture (hence they cost more) and also require up to 15% more power than TN monitors. IPS screens also have a longer response time than TN screens. IPS is commonly found on larger screens and ideal for those doing a lot of photo-editing work. Twisted Neumatic (TN) displays on the other hand come a lot cheaper than IPS displays and offer a faster response rate. The downside of TN monitors, however, is that their viewing angles are limited and color reproduction is not as good. You may have noticed that when you view a TN monitor screen off-perpendicular, in the vertical direction, the colors may shift so much that they actually invert beyond a certain angle. Here's something not a lot of people know. There are actually colors that your monitor is unable to display. This is usually measured as a percentage of the colors in a certain complete subset of colors. sRGB or Standard Red Green and Blue was a colorspace developed cooperatively by HP and Microsoft for use on monitors, printers and the Internet. It's one of the older colorspaces, if not the oldest, and only covers 35% of the colors that the eye can perceive. This means that it can't display 65% of the colors you'd be able to distinguish with your eye. AdobeRGB, as the name suggests, was developed by Adobe Systems in 1998, and covers 50% of the color space. Adobe Wide-RGB on the other hand covers 77.6% of the color space. NTSC color gamut is the typical measurement you might see and a for most ordinary use monitors, somewhere in the range of 70% is perfectly fine for ordinary use. Professional photo editors or those in design fields should look for a score above 90% to ensure that they choose the right colors. Backlight is a form of illumination in LCD displays. As LCDs don't produce light by themselves, they need either ambient light or a special light-source in order to produce an image. Backlights illuminate the LCD from either the side or back of the display panel. Backlights are used in small displays to increase readability in low light conditions. For backlighting, monitors typically use either Light Emitting Diodes (LEDs) or Cold Cathode Fluorescent Lamps (CCFLs). I won't go into the difference on how they work as i think it'll be too technical. LED backlit monitors tend to be thinner and lighter, more energy efficient and have better contrast ratios. CCFLs on the other hand tend to be preferred for color-sensitive work as they allow for better color representation. Not much to add here other than to take note of where you're placing your monitor. If there's going to be a window behind you, then be prepared for major glare on a glossy screen, which makes it really hard to look at. The bezel refers to the outside frame of a monitor. Some monitors specify a "bezel-less" design which maximizes the viewing area. If the bezel is too wide, you might want to de-bezel the monitor before combining two screens together. Otherwise, the thick frame in the middle of the combined screens might make for some uncomfortable viewing. This article turned out to be longer than I expected and there are still some terms and concepts that I haven't covered yet. I'll look to do either a follow-up article or add them to this article in a few days time. Hope you've found this article useful and if you have any comments / questions please feel free to ask away.